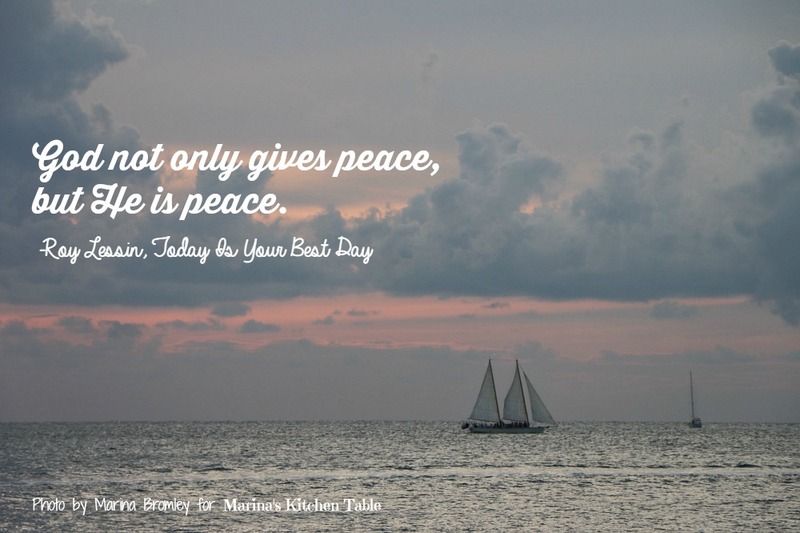 Peace is such a precious gift from the Lord. Peace has been defined in many ways - calm in the midst of a storm, quiet in the midst of turmoil, tranquility in the midst of uncertainty. The presence of peace is the absence of confusion and strife. Peace can also be defined as the deep and unshakable conviction that all is well with your soul. Peace comes when your heart is confident that God is in control, not only of the universe, but of your life, as well. Peace also comes by knowing that God is for you and by being in harmony with God as you live from day to day. Peace is also the shalom of God. One of God's names is Jehovah-Shalom. It means that God not only gives peace, but He is peace. Shalom is a word that embraces God's favor, blessing, prosperity, health, welfare, rest, wholeness, and friendship. There was a time when my family and I went to Puerto Rico to become part of a missionary team on the island. Before we left the United States, we turned over our possessions to the missionary group that was sending us. It was something we were happy to do, thinking we would be a part of the mission for a long time. The way things turned out, we only stayed with the mission for a year. Our return flight to the States took us to Los Angeles International Airport. When my wife, our two children and I arrived at LAX, we got our luggage and walked outside to wait for our ride. As we waited, I looked down at our five pieces of luggage that stood at my feet. In those five suitcases were all the possessions we owned. I had a few dollars in my wallet, no money in the bank, and no idea what I would be doing next. It was in that moment that a deep sense of God's peace came flooding over me. I had never known peace at that depth before. I was overwhelmed and overjoyed. Quietly, in that moment, I heard God's sill small voice speak these words to my heart: "My peace does not depend upon what you have or don't have. No matter how many possessions you may acquire from this time on, none of them can add one ounce of peace to your life." As I stood there soaking in what God was saying, I also heard Him say, "Any possession you may lose from this point on cannot take one ounce of My peace away from you." Today is your best day because the God of peace and the peace of God is your portion - a peace that no circumstance, thing, or person can either increase or diminish.